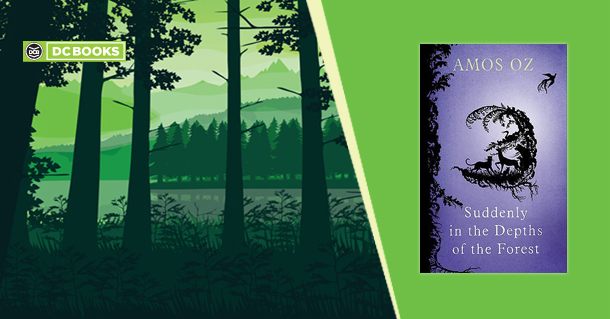 Amos Oz’s ‘Suddenly in the Depths of the Forest’, originally written in Hebrew, is set in a quiet and mysterious village, one without a hint of fauna. The skies are silent, the trees unmoving, and the river raging yet still for the animals of the sky, earth and water have all vanished. It’s been a generation since the animals vanished. The children of this decade have never even caught a wisp of a bee’s buzz, let alone seen one. And the grown-ups never dare talk about the animals except as fairytale creatures that couldn’t possibly exist. Parents tell their young ones that it was the work of Nehi, the Mountain Demon but Maya and her friend Matti know there’s more to the story. After catching a glimpse of a fish, the duo decides to unravel the mystery of the woods they are forbidden from exploring. Could it be though, that the children had simply dreamt it all up? That the stories of their crazy teacher Emanuella and Almon the Fisherman’s woodcarvings activated their hyperactive imagination? And what of Nimi, the one who was lost in the forest for days and returned with whoopitis? Did he see something that addled with his mind or is he just plain mad? While the uncomplicated language and the easy flow of the story though befit child readers, adults who chance upon the book might wonder if the story carries within it the history of the Holocaust. The shocking persecution and intense isolation Nimi, Na’aman, Emmanuella and many others who don’t fit society’s standards face ring of concentration camps and gas chambers. The dark undertone never fades and the ending, though not a cliffhanger, does not bode a positive change for the better. In fact, it doesn’t quite read as an ending, trailing off instead and leaving it to the reader’s imagination. Oz’s story is riddled with ambiguity and a sense of impending doom that blankets the entire village. However, beyond the fairytale monster and hushed whispers, the story talks about the power of words– spiteful ones – and how much they can writhe painfully in a person’s heart, and sometimes even birth vengeful evil.